According to tradition, Saint Paul was shipwrecked in Malta, in the bay that now bears his name. 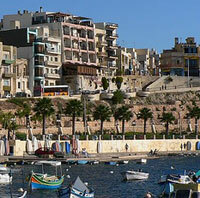 St. Paul’s Bay is now one of Malta’s largest and most popular year-round seaside resorts. It combines with its neighbours Buġibba and Qawra to make this region one of the most visted areas in the island nation. Further inland is the high, limestone Wardija Ridge, a scenic and quiet place for a stroll, a ride or a day of investigating interesting geological formations. The usual tourist attractions are here, from seaside recreational facilities to hotels to restaurants and clubs. Also worth a visit it the 17th century defensive outpost Wignacourt Tower, which is now a military museum. St. Paul’s Bay’s palm-lined promenade stretches along a rocky foreshore all the way to Qawra Point and passes three small harbours. Dozens of boats of varying sizes make their way to the bay and become part of the beautiful, sun-drenched view. 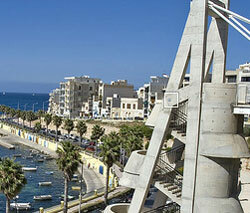 Malta’s biggest resort areas are in its rocky northern region. Buġibba and its neighbour, Qawra, are popular, built-up places packed with hotels, restaurants, bars, clubs, shops and apartment blocks and teeming with tourists and locals. Buġibba, on the tip of the peninsula facing St. Paul’s Bay, is the bigger and noisier of the two. Buġibba's beach is quite rocky, except for an artificial sandy beach next to a resort. The promenade is lined with shops, cafés and bars and has a beautiful view of the bay. Despite the crowds, Buġibba's waters are generally clean. Qawra is a little less noisy and built-up than its bigger neighbour, Buġibba, but it is still a big tourist town. 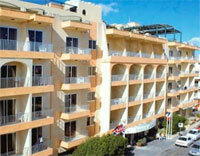 Its residential areas are more upmarket, including the apartment blocks facing the rocky beach. Qawra has recently undergone some renovation. It is packed with restaurants, bars, cafés, shops and hotels. The New Dolmen Hotel, the most posh hotel in St. Paul’s Bay, has an interesting attraction: the grounds contain Neolithic remains, and the hotel is even named after them. Set amid beautiful view of green valleys, the seaside resort of Xemxija is the gateway village to Golden Bay and Mellieħa Bay. It has a small fishing harbour and some hotels and restaurants, but the commercial scene is small compared to those of the bigger tourists town nearby. There are also several apartment buildings in Xemxija, some built in the 1990s, some a little older.